(7/01) Mike Bisping wrote; "On occasion, I fish a small 400 acre lake for walleyes in the Backus-Hackensack-Longville area. As you might expect, the lake is stocked by the DNR and I find that a lot of the fish relate to the weedline in 10 to 15 feet of water once it gets established. Typically, I experience the "summer peak" bite around the 4th of July give or take a week either way. During this time, the fishing is good, especially for larger fish. However, I struggle to find the walleyes before and after this time period. Do they eventually head out to the feature-less main lake basin and follow schools of baitfish? Do they still relate to the weed line, but only bite sporadically due to the abundance of forage? Are they recovering from spawning and not biting earlier in the year? I have not been able to put the pieces of the puzzle totally together. A) Mike, congratulations! You have asked enough questions right here to provide material for an entire book. It's going to take me a few days to get into all of it, but here's a starting spot. After spawning: I know that it can be frustrating, but there are times when any given body of water simply doesn't produce a lot of action. Technically, there is no such thing as water that's too cold; if they need to, they will feed. The real problem is that during cold water periods, any cold blooded critter, fish included, have lowered metabolisms. They don't feed as often because there's no need for them to do so. They will, especially when an easy meal pops into view, but they don't have to. After spawning, females may spend a few days in the recovery room, but it doesn't last all that long and it's more likely that they migrate into open water. Male fish will remain aggressive, even after the spawn, feeding whenever an opportunity presents itself. Finding hungry fish depends on first finding their source of food and then pinning down the time of day when the feeding occurs. Stocked Walleyes live in the weeds: It's a proven fact that the vast majority of stocked Walleyes will head for the vegetation and stay there. So except during the fall turnover, an educated guess tells me that if there are healthy weeds anywhere and the fish are not near by, then something is attracting them into open water. If your lake has an abundance of insect larvae, then areas that feature a marl bottom will be likely feeding areas. It's not uncommon to find Walleyes wallowing over a soft bottom that's providing protein via bug hatches. We think about insects during the times that we can see them. But the larvae go through a variety of transitional stages before they emerge at the surface. Mid-summer, main lake basin flats for Walleyes.Without knowing any of the details about your lake, it's questionable whether this will apply to your situation, but it's worth checking. There are certain lakes in the Itasca region where Walleyes will move smack dab into the middle of the lake during July and August. I do know that it happens; I just don't know exactly why they do it. A logical first reaction would be that these fish must be suspended. They could be, but most often they are located near the bottom. It occurs most often in lakes with maximum depths in the 25 to 35 foot range; especially ones that don't have tons of structure. Knowing that this is a possibility, I'd suggest spend some time moving around the main lake basin, watching your electronics. Without a doubt, you're going to see fish out there. 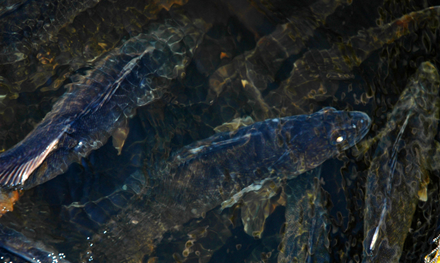 The question you'll need to answer is whether or not they are Walleyes. If they are, then there are a few ways that you can fish for them. Using lead core line for trolling crankbaits is effective to present lures to fish that are deep and scattered. If you're not into setting up rods for lead core, you can substitute snap weights instead. Either way, trolling the deep water flats is a good way to cover territory and pick off some of the fish that would otherwise go UN noticed. Power bobbering is an option too and it's actually really simple to do. With slip floats rigged and ready, you move across the flats watching for fish on your electronics. When you spot a likely target, shift your engine into neutral and release your baits. It just like dropping a marker buoy except that you bait is the marker. Typically, Walleyes spot the bait and pick it up within a few minutes. If they don't, continue trolling to find another likely target. Depending on your lake, the fish could remain in open water all summer. But in lakes where Oxygen depletion occurs in deep water, fish can be forced back toward shallower flats. If your lake has a deep weed line, this could be especially true. If this is the case, then the secret to catching them is to be aggressive. Trolling spinners at 1.1 to 1.5 MPH will trigger fish during the warm water period. Trolling crankbaits at 1.7 to 2.7 MPH, sometimes even faster will turn the heads of fish that have snubbed more conventional, finesse presentations. For many of the fishing guides in my area, a single blade, single hook spinner tipped with a 1/2 night crawler or a Fathead minnow is the staple presentation in warm water. As fall approaches, Walleye behavior becomes predictable. Remember those weeds that you mentioned? They are about to become the focal point for feeding fish that want to cash in on the bounty that's been protected by the heavy cover throughout the summer.